Click Here for Free 30 Day Trial of Red Rhino Electrical Estimating Software Sign up and you will immediately receive an E-mail to access Red Rhino Electrical Estimating Software. 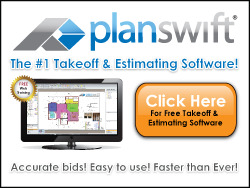 After you have completed your material take-off and entered the information into your electrical estimating software, you will need to do a bid review. A bid review occurs when you take a detailed look at the estimate to make sure that you have included everything. It is preferably done by more than one person, and is usually done just before the bid is due to be delivered to the bid requestor. Last minute changes are not uncommon. This is a time of looking at the details of the bid and “tweaking it” as necessary. I greatly favor using electrical estimating software because the good ones have an estimate summary called a recap. The recap provides information that assists you in analyzing and scrutinizing the labor and material costs. When I review a bid I like to take a red pencil to a printed copy of the recap and literally go over every line of the estimate. I like to check mark the items that I see that make sense and put a question mark by the items that I need to look at a second time. I look at and evaluate items like total labor hours and total material cost, quotes for materials and direct job expenses (DJE). I take a few seconds on each item and think about if it makes sense or not. Time to really analyze the estimate - My thinking goes something like this: "I see that there are 42 man hours to set and wire the switchboard...that seems about right. Let me see, did I put in dollars for a fork lift to get that off the truck and labor to get the gear from the truck to the electric room? OOPS! I’d better add another 4 hours to move the switch gear." Or like this: "Let me see...there are 1,004 total hours in the job which is 125 man days (8 hours per man day). I plan to run a 4 man crew. There are 31 working days on this job for a 4 man crew. The project duration is 66 days so I know I can finish on schedule." Have another person review the bid - "Sometimes you can't see the forest for all the trees", meaning, when you get all involved in the minute details of building an estimate you could miss some glaring detail during the review. Having another person review the bid with you will bring a fresh perspective and help you to avoid "Gap-osis" (something major that is left out of the bid by mistake). Two sets of eyes are better than one. They may spot something that you have overlooked. If you have no one to review the bid with you, then carefully review the bid by yourself. Good electrical estimating software also allows you to share your estimate easily with co-workers. * Did I include the cost of light fixtures and switchgear? * Did I include the cost of sub-contractors or other quotes? * Did I include the correct percent of sales tax for materials? * Did I include truck and tool expenses? * How about perishable tool expenses like drill bits saw blades and roto-hammer bits? * Did I include labor cost for work performed on overtime? * Double check your input for expenses. * How much profit will I make per month? Is my estimating software set to include my minimum profit margin? Check and double check the numbers! This important step will keep you from leaving money on the table. This is where good estimating software will help you check faster, increase your accuracy, and improve your profitability!